Yes, March is nearly over, but believe it or not there’s plenty of places that are still very cold right now. That shouldn’t keep you off your bike. There’s something ultra-satisfying about the incredulous looks you get from people when you’re out riding your motorcycle in sub-freezing temperatures. They clearly think you’re nuts, and you are. But with the right gear you really can ride almost all year. So in the event that you’re looking to jumpstart your riding season, or want to take advantage of end-of-season deals on winter gear, here’s a look at how a total idiot (yeah, that’d be me) goes about riding in the cold. It’s cold out there, folks. And just like rain, the icy blast has a way of finding its way into any gap in your gear. That’s why you want to get the most cover you can get – especially at your most exposed parts. This winter I finally got around to wearing a balaclava under my helmet. This makes me look like some sort of crazed bank robber when I take my lid off. But it keeps the sting off my face, and more importantly my neck, even at highway speeds. The only drawback of wearing the baklava is that my visor tends to fog up quickly when I’m at a stoplight. But that goes away once you crack open the shield or get moving again. I rotate between a $50 Klim Covert, which has Windstopper panels that to tuck deep into your collar at the chest and back, and a more compact $40 Dainese D-Core that has as softer, more breathable feel, but doesn’t tuck in as far. When selecting a balaclava: These things tend to top out at about $60, so in the often expensive world of motorcycle gear, it’s a small investment that can do a lot to keep you warm. It’s really a matter of finding what you’re most comfortable with. Also, remember that these things tend to fold up small, so be ready to lose yours between seasons. You can almost spend as much as you want on a beefy winter riding jacket. But for those who prefer to spend more time on the bike when it’s nice out, it probably makes more sense to invest into a high-end riding jacket geared toward warmer weather. This winter I’ve wore a blacked-out Rev’It Milburn jacket, which looks a lot like a grown-up version of the bomber jacket I used to wear to ska shows in the 1990s. A Hydratex liner keeps you dry, and it comes with a zip-in thermal liner to keep you warm. The armor in the elbows and shoulders is so slim it’s barely noticeable. But it’s rated under the CE Level 1 standard, the weakest by Europe’s CE rating standard which classifies armor by how much force is transmitted through it to the body. That makes it a little less safe and confidence-inspiring as the beefier Level 2 stuff common to more technical jackets. And it doesn’t come with a back protector. But off the bike, there’s little to give away the $299 Milburn as a motorcycle jacket, which makes it a little more fashionably versatile. I’m a fan of replacing zip-in liners with my own mid-layer, so I have something to wear once I get off the bike and stow the jacket. Snowmobile experts Klim make the super-versatile Torque jacket that’s stuffed with 3M’s Thinsulate Platinum insulation. The $190 jacket is surprisingly toasty even when worn alone. Some may have a hard time accommodating the hood over a tall collar, but I found it helps as another barrier to cold wind hitting my neck while riding. Plus, the jacket can be rolled into the hood for easy storage or for use as an emergency pillow. For riding to work, I wear a pair of $350 Rev’It Commuter pants that fit easily over my jeans, and have long zippers that make it easy to take them off in the parking garage to stuff into my panniers when I get to work. They have the same Hydratex waterproof liner as the jacket, and I’ve added a pair ultra-dorky Velcro suspenders (thankfully kept hidden from public view under the jacket) that keeps them from drooping when moving around off the bike. When selecting cold-weather outerwear: Decide whether you need to have pricey Gore-Tex lining or if you can live with versions like Hyrdatex developed by individual outfitters. Gore-Tex has long been the gold standard when it comes to blocking rain while also allowing moisture to escape from your body to avoid clamminess. The zippered vents that are your friends during the warmer months are your enemies in the cold, even when closed as wind has a way of finding its way through. So if you can swing it, it makes sense to have a separate jacket for winter riding from the one you use in the spring, summer and fall. A word on sizing: At 6-foot, 230 pounds, I tend to fall on cusp of an XXL with European gear. 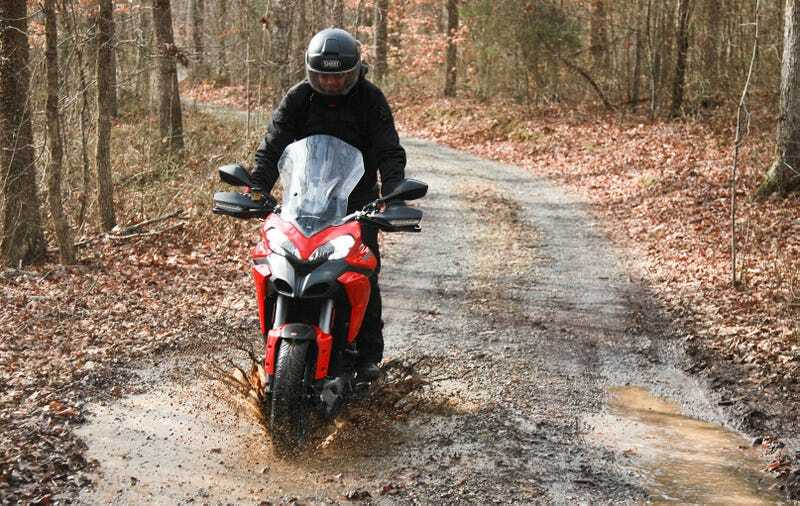 On the U.S.-designed Klim, the XL jacket ends up being a size too big. A commentary of the American physique, perhaps? Even behind handguards and with heated grips, your fingers are going to be the part of you that gets the coldest the quickest on the bike. You can get some chunky gloves fairly cheaply, but you’ll soon find your hands getting clammy and, inevitably, cold. More than with any other bit of gear, you’re going to want to splurge for Gore-Tex and fancy insulation with your gloves. I’ve been riding with pairs of Dainese Scout Evo and Rev’It Stratos GTX gloves. At $180, the Daineses are padded with Primaloft and have a big elastic Velcro strap across the cuff for easy removal. The Rev’It gloves cost about $160, and use Thinsulate to keep your hands warm. I never quite got the hang of the single closure mechanism on the Rev’It glove, but the cuffs are a bit slimmer if you want to wear them under your jacket sleeves. A word to the wise for both sets of gloves: Try to avoid letting your hands get wet before putting them on as your fingers will get caught on the lining as you try to put them on. Annoying. When selecting gloves: Sizing makes a huge difference. Nothing worse than the cramped feel of gloves that are too small, or the floppy feedback of ones that are too big. Unfortunately, trial-and-error is the best bet for getting the right fit, though as a general rule go a size bigger on European gloves than the ones made by American outfitters. In the warmer months, I run an aftermarket short windscreen for my Ducati Multistrada to flow more air. And it’s tinted, because summer. In the winter I send my resident grease monkey (my teenage son) out with an Allen wrench to install a much taller touring screen that helps guide the arctic blast over my head. Mine is made by Spanish screen maker Puig and costs $125. It makes a world of difference. Another way to keep your hands warm is by installing old-school handlebar muffs like the $100 Barkbuster Blizzaard hand guards or the $50 Oxford RainSeals. Neither are going to win any style points, but there’s a price to pay for keeping warm. (Neither fit over the hand guards of my bike, for what it’s worth). When setting your bike up for cold weather riding: Try to make it as reversible as possible. There’s nothing worse than spring breaking out and being stuck behind the super-tall windshield. It probably goes without saying that you can spend as much as you want on motorcycle gear. While it’s often the case that you get what you pay for, I’ve found that for my winter riding purposes the upper mid-range stuff tends to do the trick. Yes, the Rukkas of the world will sell you much more technical winter gear (and charge you for the privilege), but I’m not really looking to rack up serious miles until the thermostat starts to get nearer to the 50-degree mark. Looking over my list, my daily winter commuting setup of balaclava, mid-layer, jacket, overpants, gloves and tall windscreen still approaches the $1,200 mark. And that’s not counting my boots and helmet, because I wear those in the summer, too. But safety and comfort are always worth paying for if you spend any amount of time on a motorcycle. A morning blast through the frosty morning air does a much better job of getting me ready for the workday than several coffees. And the ride home is reinvigorating after a long daily grind.